I am mesmerized. Utterly and completely. 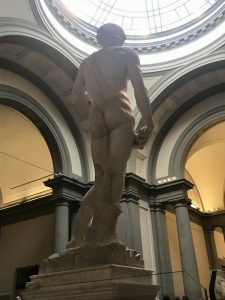 The Duomo in Florence is amazing, and as we rounded the corner and spotted her, gleaming, heavy, powerful and majestic, I take a moment. 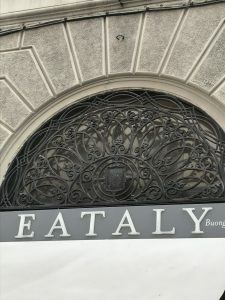 It’s not a new moment – for me or almost everyone who sets their eyes on the Duomo. But in fact it’s a moment I have every time I see it. It’s rather impossible to explain, but I could truly stare at the Duomo for hours on end. 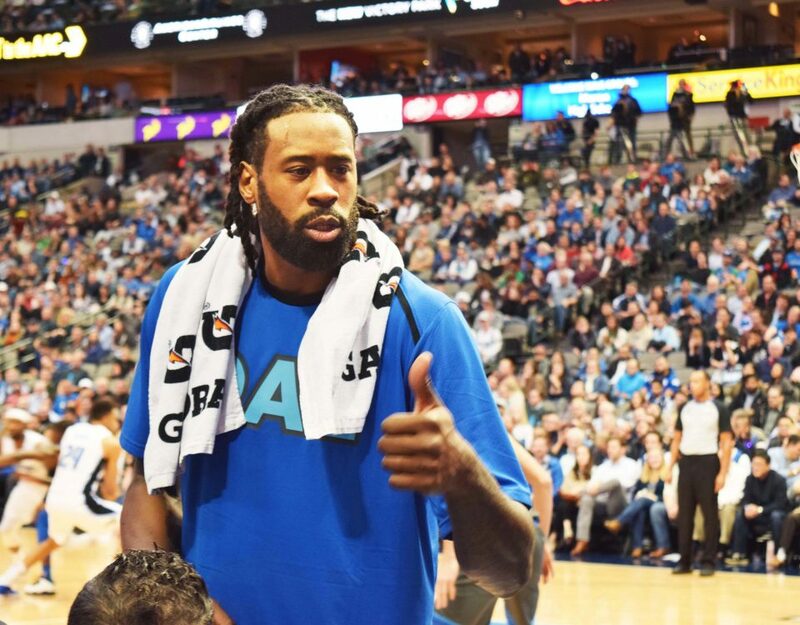 It stands for something. Perseverance, symbolism, strength, and so much more. 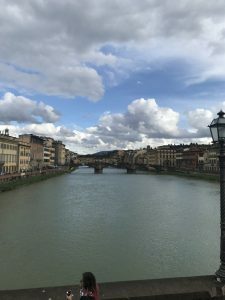 I’m sure even old Cosimo Medici would be proud to look around now and see his 12th century vision still making people like me stop and breathe and stand in awe. My husband feels it too, but probably to a lesser degree than I do. And I realize that I’m standing among throngs of people (tourists and locals alike) and I’ve been completely alone with the Duomo for, well, I’m not sure exactly how long. The Duomo took 140 years to build and if you’re up for a workout, you can climb to the cupola (463 stone steps) for the best view of the city. 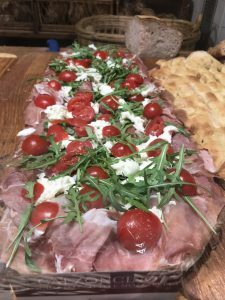 Snapping back to reality, it seems that our walking around this incredible city has worked up an appetite, so off we go in search of some of the city’s tasty treats. 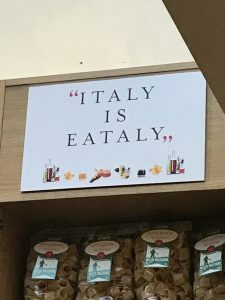 One of the best spots to visit is ‘Eataly’ – a restaurant, gourmet shop and all-round, relatively new Florentine institution. 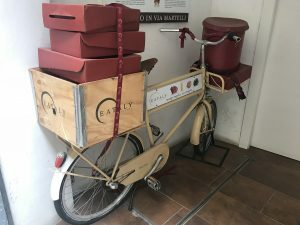 Lunch here is a taste trip through Florence, and while the food is incredible, so is the opportunity to enjoy some fantastic wine and just watch the world go by. 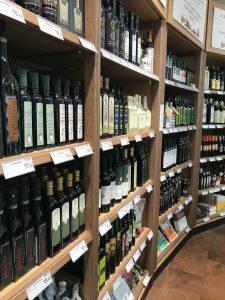 And I dare you not to want to buy an extra suitcase and fill it with all the incredible local products! 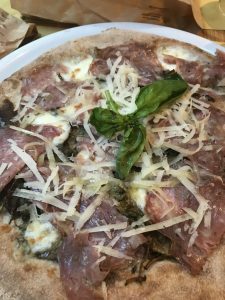 We opted for two incredible flat breads, both of which were delicious – and gave us all the energy we needed for more exploration. You’ve heard me say it before, but taking the ‘Hop On, Hop Off’ bus when you first arrive in a city is a great way to get your bearings and begin to plan where you want to spend your time. 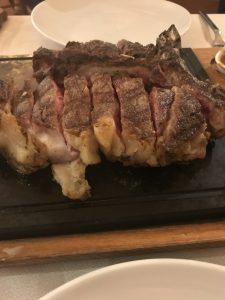 We did this once again in Florence and it didn’t disappoint. Incredible views and great commentary once again on the bus. 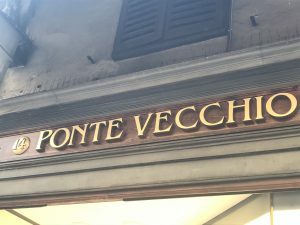 We hopped off at the Ponte Vecchio and strolled the jewellery shops. This bridge is one of the most memorable we’ve ever crossed! Imagine building not just a structure to span the river, but then incorporating shops all along the way. The prices here for gold won’t be the best, as you’re in the heart of the tourist district, but it’s fun to check out. Some of the Etruscan art and jewellery is also fascinating. 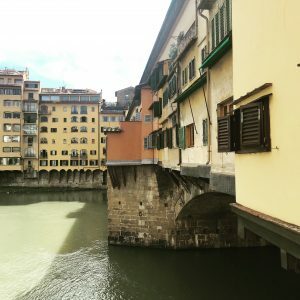 Florence was heavily damaged during WWII, but apparently Hitler spared the Ponte Vecchio as he felt was too beautiful to destroy. 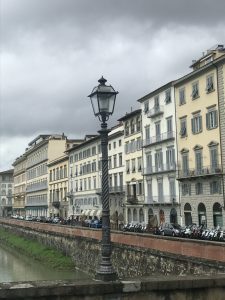 Strolling along the Arno towards the Uffizi Gallery is sublime. Once inside, be sure to get a day pass and take your time – the history lesson you’ll get there is second to none. Back outside, the river isn’t navigable by powered vessels, but it’s teeming with rowers (there’s even a dragon boat festival here!) and sipping a glass of prosecco while watching them paddle along the river is an extremely enjoyable way to spend an hour. 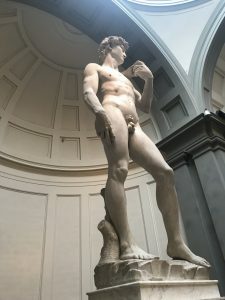 On our next day in Florence, we made our way to the Galleria dell Accademia, best known as the home of Michaelangelo’s David. If you go on the first Sunday of each month you’ll be pleasantly surprised at your admission ticket price. Nada! You read that correctly – it’s free once a month. 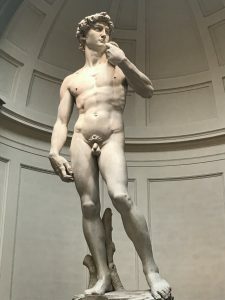 Before going to Florence, a friend said, “Be sure to give yourselves enough time with David,” which I thought a bit of an odd comment. We’ve been to other museums and seen other sculptures so I didn’t quite understand what he meant. Until we got there. Studying this piece requires time and every minute is worth it. Michaelangelo’s details are stunning and you will regret it if you try to rush. 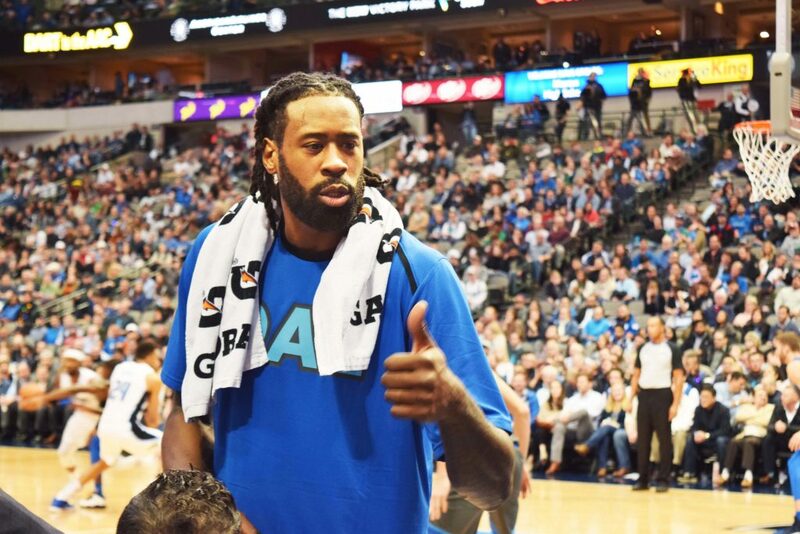 Soak it up and appreciate the masterpiece you’re seeing. 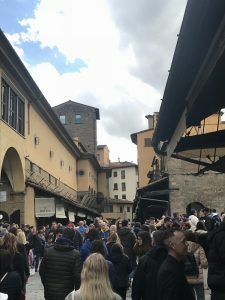 Pro tip: At least my strong recommendation – is to visit Florence on the Easter weekend. Why? Well – don’t expect ridiculous crowds, hot weather and high prices. What you can bank on is no waiting for attractions, friendly people and still pleasant temperatures. 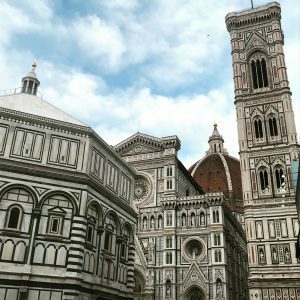 We happened upon the Duomo on Easter Sunday and what an amazing experience we had! 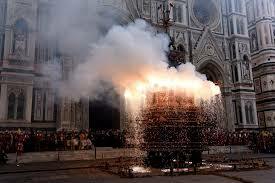 Scoppio del Carro – translated to Explosion of the Cart – is an absolutely fascinating and wonderful tradition. It goes back to the Crusades. You’ll only see it on Easter Sunday, and let’s just say it was an unexpected, pyrotechnic highlight of our trip! 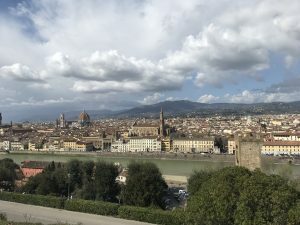 Florence is a fascinating city – different from Rome – and the Florentines (or Fiorentino in Italian) are fiercely proud, friendly and welcoming. This is a city that will have you longing to return – sooner rather than later! Until next time Florence – arrivaderci. 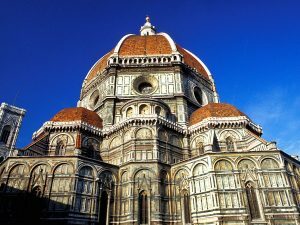 If you go, there are countless options for accommodations, but we chose the Hilton Florence Metropole, which is out of the downtown core, but offers free hourly shuttles to the Santa Maria Novella train station, right downtown, and within walking distance to all the city’s major attractions. A solid, budget conscious option. ‘CAO’ (Chief Adventure Officer) is A.J. 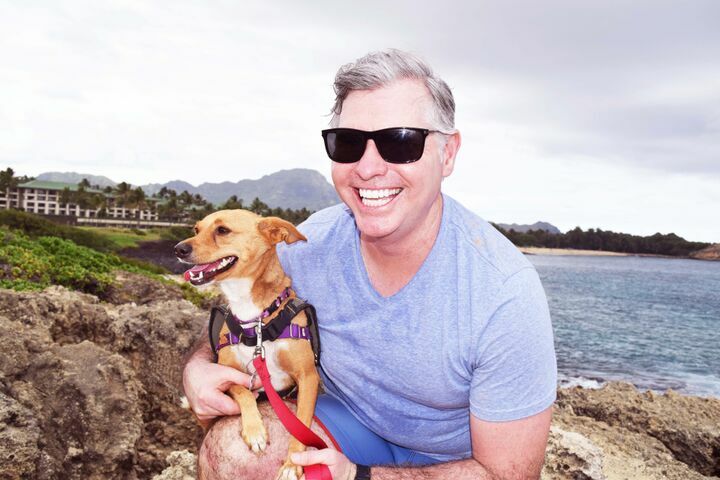 Williams, a travel blogging, food & wine lover who writes for various print and online publications. She's never happier than when she's dragging a bag through an airport (no really!) heading off on another adventure!